Footprints in the Butter: Book Review: How Do We Know the Bible is True? 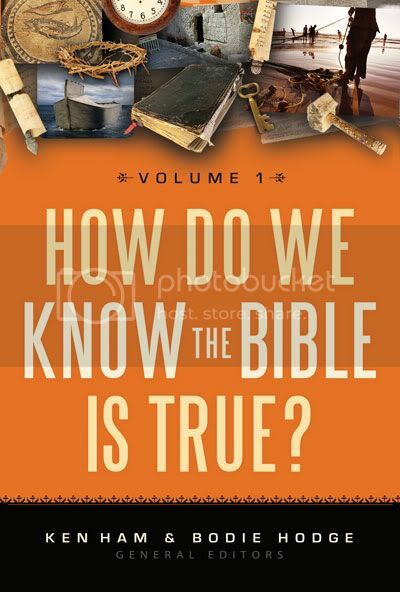 Book Review: How Do We Know the Bible is True? I've read or watched a lot of materials talking about the truth of scriptures, and I didn't really think I needed another one. But How Do We Know the Bible Is True? showed up in my mailbox, so I knew I'd be reading another one. Edited by Ken Ham and Bodie Hodge, this is a collection of essays by a number of different authors -- I counted 18, but I could be wrong. The publisher's blurb says "more than a dozen." What this means is that you can't really read the book from beginning to end, expecting that the arguments are going to build on each other. But it is arranged in a reasonably logical order. I read the introduction and the first few chapters... and from then on, I would pick up the book and choose a chapter that looked interesting, or even one that just looked like the "right" length for the time I had available. I have not read the entire book at this point, but I've read a lot of it. Today there are untold voices in print, on television, and online calling for our attention, and so many of these mock or belittle our faith. From coworkers to those calling themselves Christians, the tone has become one of reproach, disparaging the character of God and undermining the authority of the Bible. For those who have a heart for God, it can be intimidating and discouraging. Is the Bible totally without error? Did the resurrection really happen? How do we know that the 66 books of the Bible are from God? How were people saved before Jesus came? What is the purpose and meaning of life? Was Genesis derived from ancient myths? How should we interpret the Bible; should Genesis be literal? Do you have to believe in a young earth to be saved? Within these pages you will find responses to those honest questions of faith, helping to build a confidence in God’s Word and inspiring your daily walk in His grace and peace. These powerful biblical insights are soundly presented by more than a dozen respected defenders of the faith, including Ken Ham, John MacArthur, Terry Mortenson, Jason Lisle, Brian Edwards, Tommy Mitchell, Jobe Martin, Georgia Purdom, Bodie Hodge, and Roger Patterson. What I liked about this book is that it is getting into some issues that I really haven't seen in some of the other works I've been through. There was a fascinating discussion about the word "inspired" for instance. I loved the chapter on Mary and the whole perpetual virginity thing. I also enjoyed the chapter on what day Jesus died and rose -- and I thought the authors of that chapter did an excellent job of laying out the arguments and their pros and cons. What I didn't like? Well, some of the points made are a bit shallow, and in some places there is just an uncomfortable tone. I know I'm that way too... I know something is right, so I get a bit of an attitude about people who don't 'see the light' so to speak. I think as long as you go into it knowing that this is an introduction and not a thorough in-depth analysis, there is definitely some stuff to chew on. This is a book I will have my kids work through in high school. Lots of great stuff here, and it is mostly well-presented. What kinds of materials do you use with your kids? Does How Do We Know the Bible is True? sound like something that would work in your family? Disclaimer: I received this book for free from New Leaf Publishing Group. No other compensation was received. The fact that I received a complimentary product does not guarantee a favorable review. This looks like a great book. I'm on the lookout recently for books to add to a high school level apologetics course that I want all of my kids to take. And, I'm a Ken Ham fan. After having him as a tour guide in Australia, um 13 years ago, it's been fun to see his rise to "fame." I need some recipe ideas! Book Review: Has God Spoken?